Well, I'm back, and it was an amazing experience! Harley thought carefully about this and decided not to teach anyone individual acts, but rather to have the three of us spend three very full days learning a selection of feats. I found that things that we learned from one feat helped us to approach the next one, and the feats were arranged in a logical sequence. Harley is tremendously skilled at watching people, and was almost like an externalization of our interior voice. He knew when we were frightened (and all of us were at some point!) Harley would talk us through it. He also watched us to see how we might come across in performance, while each of us looked carefully at the others to make suggestions. Those of you who know Harley know that he is extremely knowledgeable and has a massive amount of performing experience. This would mean little if he were not an excellent teacher. I think that his background in counseling contributes greatly to his ability to teach these feats. He is also a really nice guy with a joyful heart who told us all several times what he was learning from us. He provided a really safe environment to learn some dangerous feats. The photograph of Harley and Me on the sword ladder was taken by Mark Poolos. Along with all the others you will see by clicking here. I could enumerate on all the acts that Harley taught us, but I think in doing that I would miss a more important point. Which was Harley taught each of us something much more valuable -- the ability to understand how we have acquired fears of things that are not supported by our bodily experience, and by going through each of the many doorways he lead each of his students through, helped to our improve use as performers. I also learned a great deal about feats that I already perform and had a lot of fun in doing it. 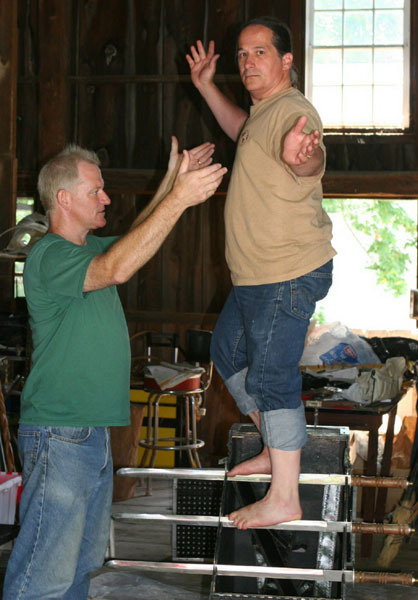 If you have ever thought about learning sideshow acts, let me suggest you learn them from a master. You will want to sign up for his course the next time he offers it.